This past weekend, the team spent Friday evening and the better part of Saturday at Katie's parents' house painting the family room upstairs. Her parents had been kind enough to offer us the job in exchange for making a contribution to trip fundraising efforts, and so began twenty four hours of wall to wall madness! 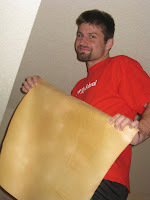 While our collective array of artisanal acumen might not leave us with any jobs as home contractors, we had a grand old time stripping the wallpaper, priming the wall, and--after much anticipation--actually painting the wall. The amateur craftsmen among the readership will be interested to know that Katie's parents opted for an ecru color scheme with a textured finish-- très magnifique! 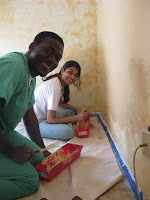 Whilst painting, the team enjoyed the special talents of Wade's ability to remove entire sheets of wallpaper without tearing them and Nishina's trowel strokes of genius. We learned that Josh has an obsession with moonlight. We even filmed a montage scene where we laughed and flung paint all over one another while the song "Girls Just Wanna Have Fun" played on the radio. OK, that last part was a joke! For our efforts, Katie's parents contributed a monetary donation to our trip fund--thank you! 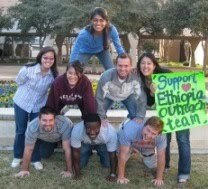 Special thanks also go out to UTHSCSA Haiti trippers Krista, Tiffany, and Matt, as well as Ethiopia friend Shushan, for their generous donation of time and labor over the three day weekend.